Venezuela’s Maria Puerta 3k (L) took down the much stronger – and younger — Wan Kao Lou 5d of Macau in the third round of the World Amateur Go Championships Thursday morning . 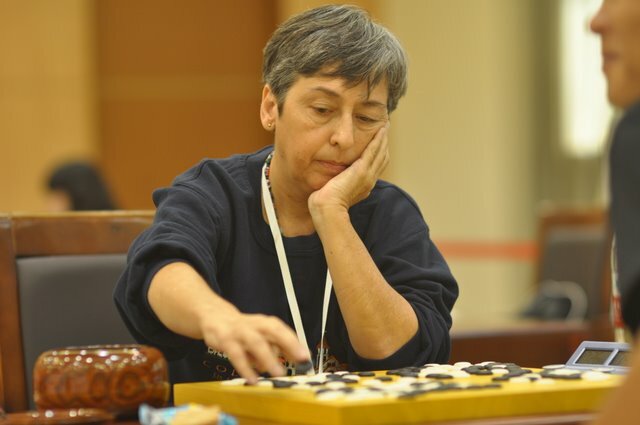 The 54-year-old Puerta – who’s the President of the Venezuelan Go Association and a Director for the International Go Federation – won an enthusiastic round of applause from her fellow players during the lunch break. In other Round 3 results (click here for latest results, available by 6A EST), Thomas Hsiang 7d (U.S.) defeated David Ormerod 5d (Australia) but faces China’s Wang Chen in the 4th round (click on “read more” below for Michael Redmond 9P’s commentary on Hsiang’s half-point win over France’s Thomas Debarre in Round 2), Chinese Taipei defeated North Korea, Canada lost to Korea, Argentina defeated Hungary and Austria lost to Hong Kong.